You’ve been begging your landlord to fix the torn linoleum in your bathroom and replace your dripping bathroom faucet—and he’s finally come through. Before you know it, maintenance people are making their way into the apartment to make the changes you asked for, which means you have to move your furniture around and there are sharp items and potentially hazardous substances in your home. That’s not great for you, but it can be downright dangerous for your pets. One of the most common issues that arise during home or apartment renovations when pets are involved is that they may try to run off—stress, noise, and a constantly opening front door can provide the perfect combination for pets to run out and get lost. That’s why it’s so important to make sure you’ll be able to find your pet if they do. Before the renovations start ensure your pet’s microchip information is completely up-to-date. For dogs and cats, be sure that their collars and tags have the most up-to-date name and phone number. Make sure the maintenance staff knows there are animals around they should look out for as they work. 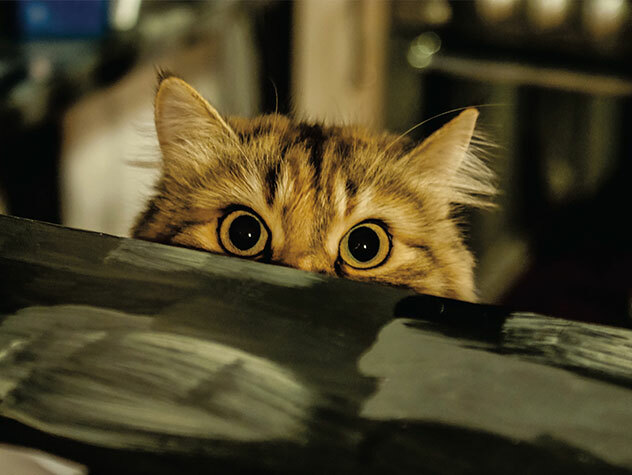 Remember that if your dog or cat is wary of strangers, you may want to take him out of the apartment completely. Be sure to find a spot in your apartment to safely and comfortably contain your pets in while the work is going on. This is practical for a number of important reasons. For one thing, your pet may enjoy having a “safe haven” of sorts where they can retreat if they’re scared or stressed. For another, confining them to a safe area will keep them away from power tools, sharp objects, hazardous materials, and anything else they shouldn’t be getting into. And finally, you will decrease the chances of them becoming lost. Try to keep a familiar routine whenever possible, especially for puppies or kittens. Go on walks when you normally do and feed meals as close to your normal schedule as possible. Many pets are creatures of habit, and they likely will find comfort in the familiar, so this is a good way to relieve some stress and make them feel comfortable. If the work takes longer than a single day, remember that you aren’t in the clear as soon as the workers leave. Before allowing your pets free roam of your apartment, be sure to do a thorough check to ensure there aren’t any dangerous tools lying around or left over materials leaning precariously against the wall. Make sure everything is stable, clean, and put away. You should also take out the trash if the maintenance staff has used it to get rid of anything hazardous or unsafe. If you can, you may want to consider bringing your pets to a friend or family’s place during the renovations—especially if they’re expected to take a while or cause a lot of upheaval in your apartment. Bring them to the home of a friend, family, or neighbor where they can socialize and relax. This is an especially good idea if your pet is already familiar with someone else’s apartment or home and visit often. If you are concerned about how your pet may handle the stress or potential dangers of renovations or repairs, you may want to consider taking them to a reputable boarding facility for a couple of days until the work is over. While this may seem drastic, it can sometimes be less stressful and safer for your pets.